Sign up and receive Property Email Alerts of Houses for sale in Parkrand, Boksburg. Elegant Entertainers Dream on Steroids!! Set within the high security perimeter of the Golden Crest Estate, this majestic double storey home offers total privacy and panache all in one. From the moment I entered through the gates of the over 3300m2 stand, I knew that this home had untold ambiance. And then it surpassed my expectations by offering me two exquisite homes totalling over 1700m2 under roof - all on one property. Imagine a home where you can host family and friends in a magnificent separate entertainment area of over 275m2. Enjoy the awesome fireplace or open up the sliding doors onto the double size shimmering pool. The kitchen is large, luxurious and modern - the heart’s desire of any gourmet chef. Downstairs also hosts a double size study with separate cigar lounge/wine cellar. In addition to that there are three spacious and elegant living areas - opening onto the pool. Or you can enjoy a relaxing time at the eclectic bar. There are 5 double volume bedrooms all with en-suite bathrooms, beautiful finishes and ample cupboards space. The generous pyjama lounge will allow for many cosy family evenings upstairs. And then there is more: Including a top of the range kitchen with modern finishes as well as two living areas - this home does not disappoint either. Upstairs offers 3 spacious bedrooms with two full bathrooms. The main bedroom includes a dressing room and also opens onto a balcony with a spectacular view onto the estate. The automated garages can accommodate up to 8 cars. There is also ample visitors parking - surrounded by landscaped gardens. This breathtaking property is hard to capture on a photo - you have to experience it firsthand. Contact me for your own personal viewing. 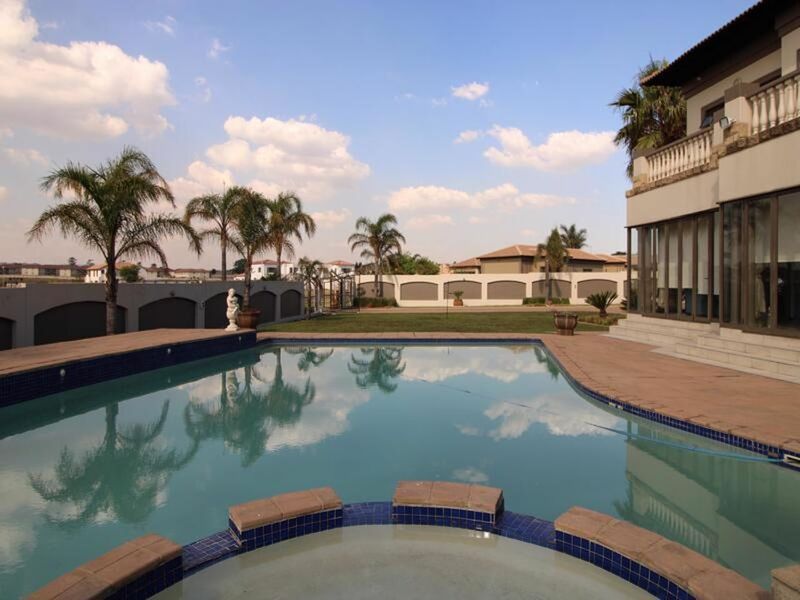 Sign-up and receive Property Email Alerts of Houses for sale in Parkrand, Boksburg.